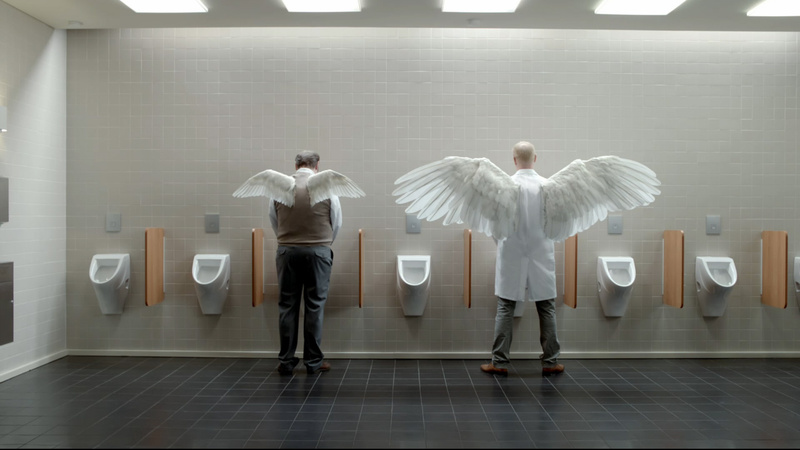 Director Tom Kuntz, working with Argonaut Inc. and MJZ, made that world a reality in this year's Volkswagen Super Bowl spot 'Wings'. And it's a world full of fluffy white feather covered wings. Tim Davies, 2D lead artist, explains; "Tom wanted wings sprouting everywhere - in the factory, bursting through sunroofs, patting colleagues inappropriately in the lift and even causing self-doubt in the men's bathroom. A lot of them were actually shot in camera, so the wings are a combination of both practical and CG. We started with an animation of the wings bursting through the white jackets. Then to make this as realistic and clean as possible we shot practical elements, like rips in fabric, to animate all the fine details needed for the perfect wing."